Machine of the month - archive features! 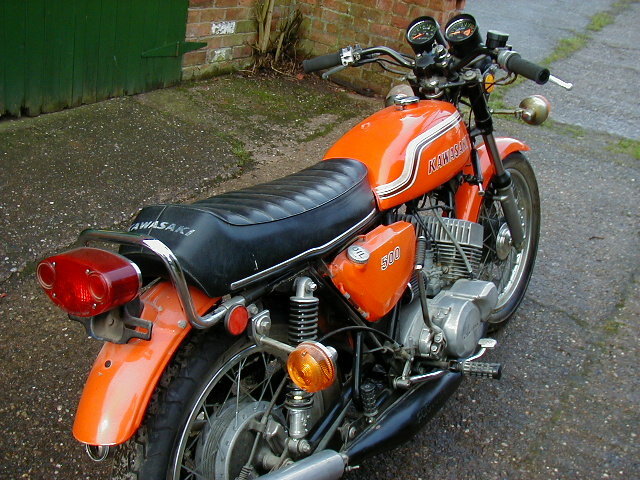 Produced between 1969 and 1976 in a range of sizes from 250 to 750cc, they really don't make bikes like this any more! Well, they couldn't even if they wanted to, because two-strokes are now effectively banned from the roads on public health grounds. But things were different back in the late Sixties. Even though California was slowly disappearing under a noxious purple haze, saving the planet could wait for a few years. For the moment, going as fast as possible was far more important. In America high-lead gasoline was cheaper than tap water (and probably tasted better), so there was no point in worrying about boring things like fuel consumption and exhaust emissions. behind the fastest large-capacity machines of the era. 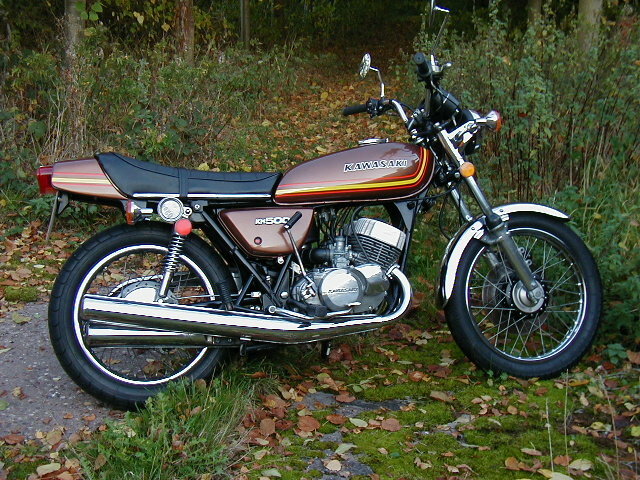 An expanded version was a possibility, but other Japanese manufacturers - principally Suzuki and Yamaha - were also churning out rapid two-stroke twins. So having set up a new base in smoggy California, Kawasaki decided to get one up on the opposition and produce a triple. Generally speaking, the more cylinders, the more power, because piston area increases, while the reciprocating parts get lighter, which allows higher revs, which... well, you get the idea. The only slight problem is that as one of the pots is sandwiched between two others, cooling is trickier, particularly if the job is being done by air. Kawasaki's solution firstly involved the obvious step of using extensive finning all over the top end of the engine. Direct oil injection also helped, being a more efficient and less messy way of lubricating a stroker than pre-mix. Incredible but true, the other cooling method commonly adopted in those distant days was to use a far richer fuel mixture than strictly necessary. As I said, it really didn't matter much if half the gas went straight through and emerged from the exhausts as pollution! Apart from having three cylinders, there wasn't really anything very clever or novel about the H1. In other respects the engine was just normal stuff for a Japanese bike: the crankshaft ran in big, rolling-element bearings; power went through a gear primary drive to a multiplate clutch and all-indirect five-speed gearbox, then emerged at a sprocket on the left hand side. The only oddities were the gear pattern, with neutral at the top then five down, plus the provision of right or left foot operation by swapping levers and pedals around. Producing 60bhp at 7500rpm, here was a 500 with more power than the all but the wildest four-strokes available. Assuming they were still alive, that is. With so much power trapped in a 1960s' chassis and applied to the road through first- generation Japanese bananaflon compound tyres, the triple quickly earned a reputation for being positively evil. If you went slowly the plugs oiled up, but if you dared open the throttle a bit and weren't prepared for the sudden rush of power at 6000rpm, you tended to end up in a heap. Cue a million 'Kamikaze 500' jokes. In 1969 motorcyclists still accepted roadside breakdowns as inevitable, so the occasional stop to change a spark plug wasn't too much of a hassle - especially since Kawasaki went to the trouble of providing a special receptacle under the seat for a spare set! Of more concern in the UK where petrol has always been relatively expensive, fuel consumption figures could be spectacularly bad. Somewhere in the 20-25mpg range was typical, to which you had to add the cost of two-stroke oil. 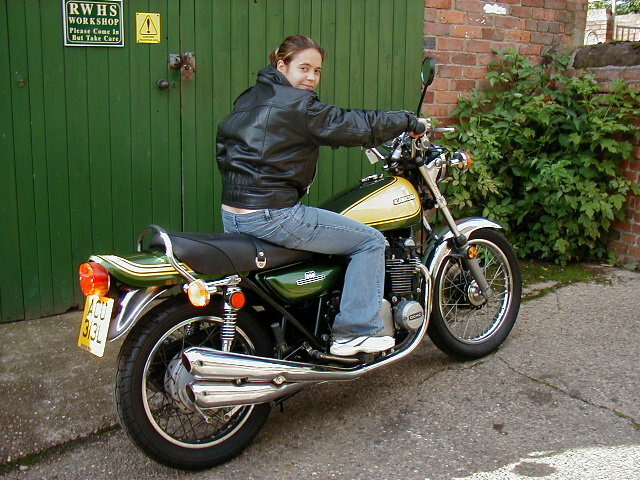 The image of motorcycling as a cheap means of transport for people who couldn't afford cars suddenly looked suspect. By the time the H1 turned into the H1-A and (surprise, surprise) H1-B in 1972, the distribution situation had improved slightly, but the now infamous triples were still very rare. Luckily for cowering wimps, by this stage some of the edge had been taken off the powerband and the handling was generally a bit less wild. The styling was also looking less quaint. The model series got a bit mixed up from then on, with some difference of opinion as to whether there really was an H1C. Even if it did exist, it apparently had either a drum brake or a disc, depending on what parts Kawasaki had knocking around the factory! There's also some confusion over the precise spec of the succeeding H1-D of 1973, but this is definitely when the 'classic' triple styling was introduced, with a broad line over the tank and large 'KAWASAKI' logo. Swoopy, as they used to say. And finally, you could even get one in a colour that made the Green Meanie nickname make sense! More mods to the engine and exhaust were made at the same time, again in the interests of silence and emissions, with the predictable side-effect of reducing power. 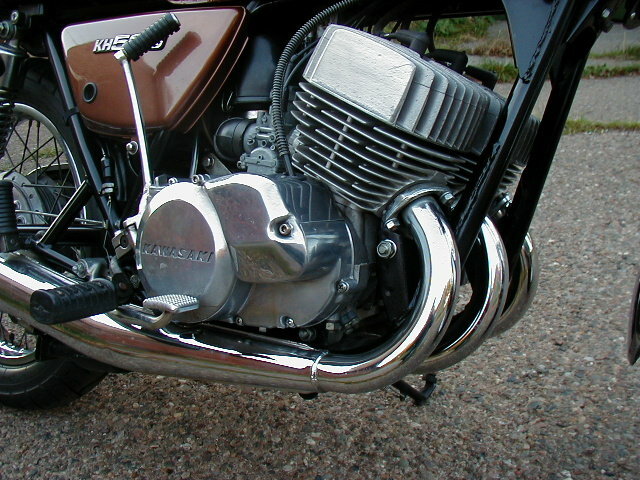 Moving on, Kawasaki made further efforts to refine the bike by mounting the H1-E's engine in rubber bushes. Yet more meddling with the exhaust apparatus hinted of the struggle with the clean air lobby. By 1975, when the very similar H1-F was announced, it was pretty obvious that the triples were due for the chop soon. There never was a H1-G. 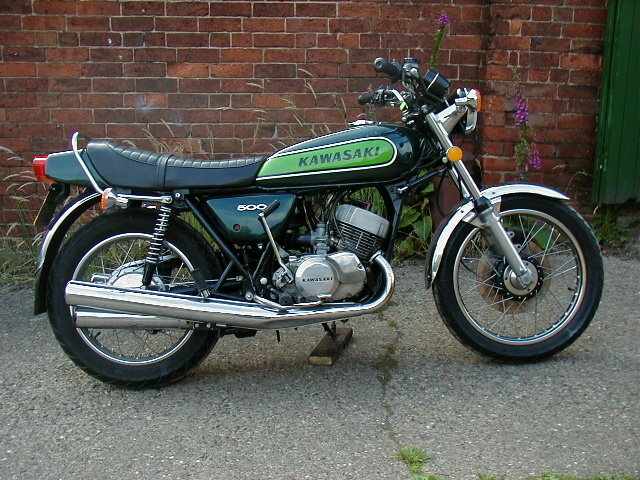 Instead, the following year saw the release of the KH500, a new model designation ('Kawasaki Highway', allegedly) for a substantially revised bike. The new corporate look didn't help the styling much to most people's eyes, but the main buying disincentive was the performance. In a final effort to comply with noise and emissions regulations, the engine had been well and truly stifled. Although a reasonable 52bhp was the claimed output, seven or eight horse down on the uncouth original, the loss seemed greater in reality. petrol and oil at silly rates. To no-one's shock, the KH500 disappeared almost as soon as it had arrived, supplanted by Z650 and Z500 fours, which logic said did everything better while still being socially acceptable. The end of an era. So much for the history. Having established that the triples are not in any way sensible motorcycles, let's not forget that logic never had much influence on motorcycling, particularly in the classic world. Some 35 years after the first H1 assaulted our sensibilities, riding an old Kawasaki triple is a like breath of fresh air (bad choice of phrase for anyone following, perhaps) after all these clean, efficient four-stroke fours. Very early Mach IIIs (incidentally, although that's what was originally written on the side, the badge was dropped from the H1-A, and just to confuse us even more, the same model was known as the 500SS in some markets) are so rare that they're inevitably going to cost a lot now. At the other end of the scale, the KH500 is also scarce, mainly because no-one wanted to buy them much in 1976, let alone preserve them for another 27 years. Despite the UK importer's worst efforts, the triples probably sold best between about 1972-1975, so these tend to be the easiest to find, which helps keep prices at affordable levels. As does the steady stream of imports from abroad, mainly from America in this case, because bikes were cheap in those days (still are, in fact) and a few dollars of gas filled the tank, so no-one was put off by 20mpg. Buying an import is usually no cause for worry, provided it comes from a kind climate! Bikes that spent their life somewhere dry like California will often be in incredibly good condition from the corrosion point of view, but parts affected by sun can be in a state of disintegration. However, it's still a lot easier to get things like tyres and tubes than hunt around for replacements for all the bits that go rusty in soggy Britain. There are always minor differences in specifications for machines destined for other markets, but the H1 does have a baffling variety of ignition set-ups. While US models always used capacitor discharge systems, here in Blighty the GPO was concerned about radio interference, so we had to make do with low-tech contact-breakers for a while. Later models used another type common to the 750. Prospective punters should be aware that ancient two-strokes are not like modern bikes. Started from cold, the engine will make huge quantities of noise and smoke. Only someone used to the triples will be able to tell if the incredible range of whines, rattles and clatters produced is normal! Once properly warmed up the smoke screen should clear a bit, but try not to breathe in until you're doing at least 5mph. If by any chance you can get a test ride, don't be too intimidated. Contrary to the Green Meanie myth, these bikes are not uncontrollable monsters that spit you off without warning, especially now we have tyres and brake pads that grip in the wet. As long as you don't try going round greasy roundabouts at 40mph in second gear, the handling really isn't too bad, honest! Truth is that while 60bhp may have been a lot of power compared to a contemporary Triumph twin with bent valves, it's not quite so hot now. Having said that, no modern engine has such a vicious step in torque, so be prepared for a sudden burst of acceleration at around 6000rpm. At low revs there's no hint of the transformation. Opening the throttle produces a deep groan but very little action. Rice pudding skins are unthreatened by the measly amount of power available. Yet, nurse it past 5000rpm to where the port timings start to work properly and the convincing impersonation of a convoy of BSA Bantams vanishes. All those jingly-jangly noises are joined by a rasp from the three chrome silencers and a piercing honk from the intakes... Next patient, Mr Lecter! Against a stopwatch, an H1 500 at full screech may not be anything like as fast as a current race-replica, but I guarantee it feels more exciting. As I said at the beginning, there's nothing else like it - and that includes the H2 750, which was deliberately made relatively civilised. Perhaps Kawasaki just couldn't afford to kill off any more customers? By Rod Ker, January. 2004. - Kawasaki Z1-Z900 "Kawasaki's New York Steak prototypes disguised as Honda CB750s were plying the roads of America by 1971, clocking up big mileages to make sure that everything was right first time. 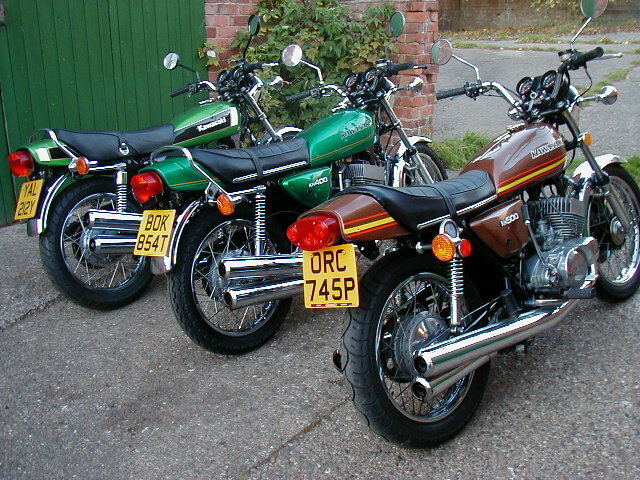 - Kawasaki 500 Triples. "If Hannibal Lecter practised dentistry, this is the sort of noise that would be coming from his surgery"! 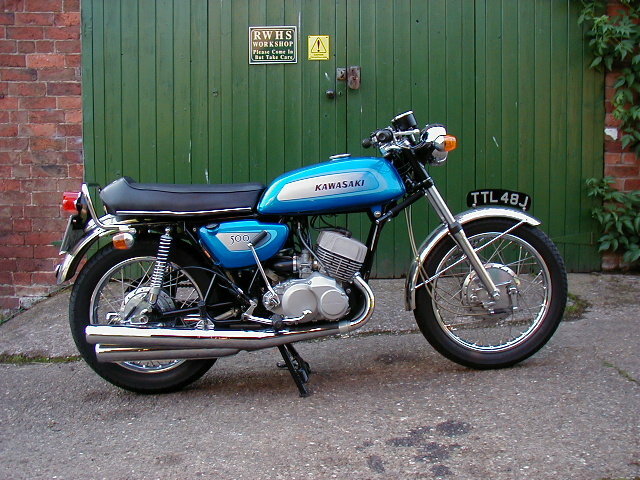 - L-Plate 250s "Life was so simple for fledgling bikers back in the 1970s. Anyone capable of walking as far as the local No-Star dealer without tripping over his flares could buy a motorcycle, slap on a pair of L-plates, and wobble off into the traffic". - Honda CBX1000 "If you don't know what a Phantom jet fighter sounds like, buy a Honda CBX and have a fiddle with the exhaust system"!